Download "3 Fla. L. Weekly Supp. 740a"
3 normal faculties, the results of any test administered in accordance with s or s and this section shall be admissible into evidence when otherwise admissible,.... S (3) provides as follows: A chemical analysis of a person's blood to determine alcoholic content or a chemical or physical test of a person's breath, in order to be considered valid under this section, must have been performed substantially in accordance with methods approved by the Department of Law Enforcement and by an individual possessing a valid permit issued by the department for this purpose. Any insubstantial differences between approved techniques and actual testing procedures or any insubstantial defects concerning the permit issued by the department, in any individual case do not render the test or test results invalid. The Department of Law Enforcement may approve satisfactory techniques or methods, ascertain the qualifications and competence of individuals to conduct such analyses, and issue permits that are subject to termination or revocation in accordance with rules adopted by the department. [emphasis added]. Under the provisions of Chapter 316, Florida Statutes (1993), FDLE promulgated Florida Administrative Code (``F.A.C.'') Chapter 11D-8, Implied Consent Program (the ``Rule''). The Rule was effective October 31, This Court has taken judicial notice of the Rule for the purposes of this Motion. Under the provisions of F.A.C. 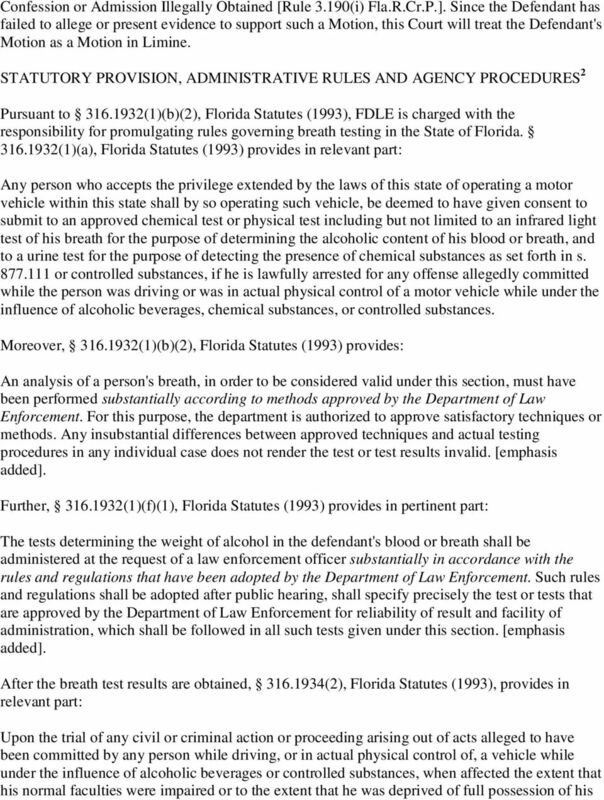 Rule 11D-8.002(6), all breath test instruments utilized in Florida must be approved by FDLE. According to F.A.C. Rule 11D (2), the C.M.I., Inc. Intoxilyzer 5000 Series breath test instrument is an approved breath test instrument for evidential use. Moreover, under the provisions of F.A.C. Rule 11D-8.003(7): When conducting an evaluation for approval of breath test instruments in accordance with this rule, the Department shall make the following checks for accuracy, precision, and alcohol-free reading in accordance with the Department and Agency Inspection Procedures FDLE/ICP Form October, (a) Accuracy -- Simulator tests will be completed for each test instrument using vapor mixtures containing alcohol at concentrations of g/210l, g/210l, g/210l and g/210l. A minimum of 50 tests will be completed at each concentration. 1. The average error at each concentration is calculated for each test instrument. The average error is calculated by first calculating the average of the 50 measurements at each concentration. The difference between the average value at each concentration and the true value at each concentration is then calculated. This calculated difference is the average error. 2. The accuracy standard for each test instrument shall measure the alcohol content of vapor mixtures with an average error of no more than ± 5% or ±.005 g/210l, whichever is greater. (b) 1. Precision -- Using the same 50 tests completed for subsection (7)(a), the standard deviation at each concentration is calculated for each test instrument. The average standard deviation of the four concentrations is then calculated. 4 2. The precision standard for each test instrument shall measure the alcohol content of vapor mixtures with an average standard deviation of no more than g/210l. (c) Alcohol-Free Solution -- Simulator tests will be completed for each test instrument using an alcohol-free vapor mixture. A minimum of 25 tests will be completed. The alcohol-free solution standard for each test instrument requires that no reading be more than g/210l. F.A.C. Rule 11D requires that all breath test instruments, prior to being placed into evidentiary use, be inspected for accuracy, precision, and alcohol-free reading in accordance with the Department and Agency Inspection Procedures FDLE/ICP Form October, F.A.C. Rule 11D states in pertinent part: (1) Accuracy -- Simulator tests will be completed for each test instrument using vapor mixtures containing alcohol at concentrations of g/210l, g/210l, and g/210l. A minimum of 10 tests will be completed at each concentration. (a) The average error at each concentration is calculated for each test instrument. The average error is calculated by first calculating the average of the 10 measurements at each concentration. The difference between the average value at each concentration and the true value at each concentration is then calculated. This calculated difference is the average error. The accuracy standard for the instrument shall measure the alcohol content of vapor mixtures with an average error of no more than ± 5% or ±.005 g/210l, whichever is greater. (2)(a) Precision -- Using the same 10 tests completed for subsection (1)(a), the standard deviation at each concentration is calculated for the instrument. The average standard deviation of the three concentrations is then calculated. (b) The precision standard for the instrument shall measure the alcohol content of vapor mixtures with an average standard deviation of no more than g/210l. (3) Alcohol-Free Solution -- Simulator tests will be completed for each test instrument using an alcohol-free vapor mixture. A minimum of 10 tests will be completed. The alcohol-free solution standard for each test instrument requires that no reading be more than g/210l. F.A.C. Rule 11D requires that breath test instruments be inspected by the Department at least once each calendar year for accuracy and alcohol-free reading in accordance with the Department and Agency Inspection Procedures FDLE/ICP Form October F.A.C. 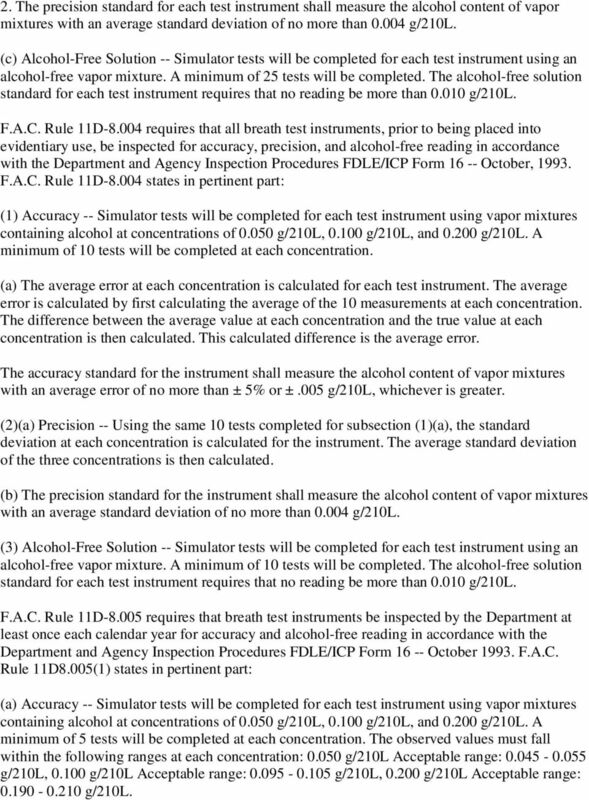 Rule 11D8.005(1) states in pertinent part: (a) Accuracy -- Simulator tests will be completed for each test instrument using vapor mixtures containing alcohol at concentrations of g/210l, g/210l, and g/210l. A minimum of 5 tests will be completed at each concentration. The observed values must fall within the following ranges at each concentration: g/210l Acceptable range: g/210l, g/210l Acceptable range: g/210l, g/210l Acceptable range: g/210l. 5 (b) Alcohol-Free Solution -- Simulator tests will be completed for each test instrument using an alcohol-free vapor mixture. A minimum of 5 tests will be completed. The alcohol-free solution standard for each test instrument requires that no reading be more than g/210l.... Monthly inspection and testing of each breath test instrument is mandated by F.A.C. Rule 11D in order to confirm the accuracy and alcohol-free reading of each instrument. F.A.C. 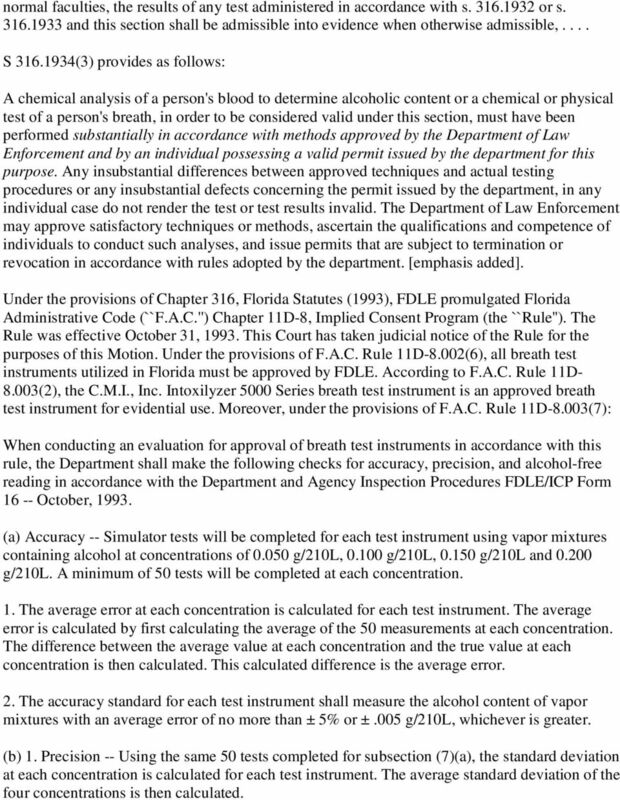 Rule 11D-8.006(1) states in pertinent part: (a) Accuracy -- Simulator tests will be completed for each test instrument using vapor mixtures containing alcohol at concentrations of g/210l, g/210l, and g/210l. A minimum of 3 tests will be completed at each concentration. The observed values must fall within the following ranges at each concentration: g/210l Acceptable range: g/210l, g/210l Acceptable range: g/210l, g/210l Acceptable range: g/210l. (b) Alcohol-Free Solution -- Simulator tests will be completed for each test instrument using an alcohol-free vapor mixture. A minimum of 3 tests will be completed. The alcohol-free solution standard for each test instrument requires that no reading be more than g/210l.... FDLE/ICP Form October, 1993, sets forth the Inspection Procedures for the Intoxilyzer 5000 Series. Step (2) requires that the Department or technician ``Mix simulator solution'' which is then tested at the various concentrations contained within the Rule. In December 1994, FDLE issued recommended guidelines for inspections pursuant to F.A.C. Rule 11D requiring the technician perform additional tests to identify the source of any out of range readings. Moreover, if the technician cannot identify the cause of the out of range reading, or if it is suspected that the instrument is the cause, the technician must indicate that the instrument fails to comply with the agency inspection standards and remove the instrument from service. 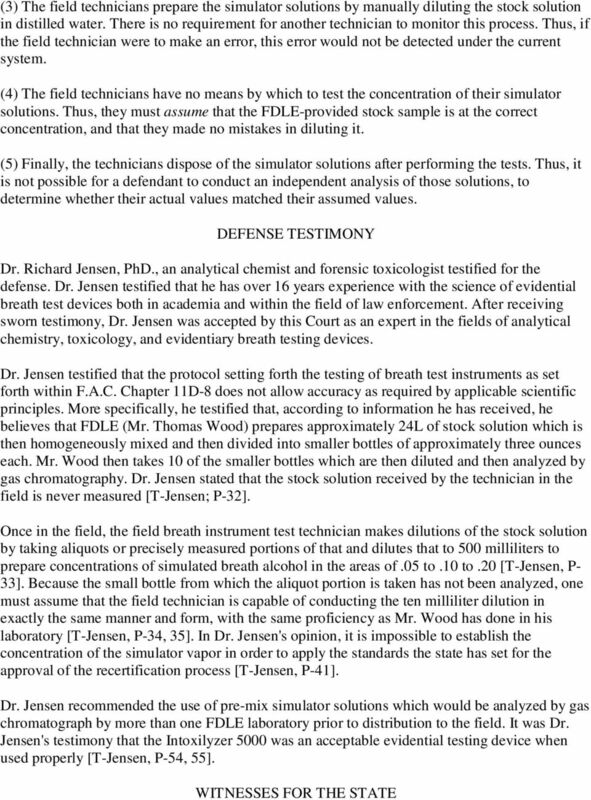 CHALLENGING THE ADEQUACY AND RELIABILITY OF THE BREATH TEST INSTRUMENT MAINTENANCE AND CERTIFICATION PROTOCOLS The Defendant, within the Motion, contends that the maintenance protocol used for breath-test alcohol testing is unreliable, because the simulated tests are conducted without verifiable alcohol concentrations. The specific alleged weaknesses contained within the Defendant's Memorandum of Law in Support of Defendant's Motion to Suppress, are as follows: (1) The test solutions are diluted from a stock solution which is prepared at the FDLE labs. The stock solution is tested on a gas chromatograph to verify its concentration. However, this test is performed only one time, by a single operator. Thus, if an error in testing occurred, this error would not be detected under the current system. (2) The field technicians who perform the actual tests of Intoxilyzer machines do not know the actual concentration of the stock solution as determined by gas chromatography, because it is not printed on the bottle. Thus, the field technicians are preparing simulator solutions by diluting from a stock solution of unknown value. 8 breath test instruments for the past three years [T-Gray, P-4, 5]. Ms. Gray also functions as the records custodian for the Central Breath Testing Unit (``CBT'') of the HCSO. Ms. Gray uses the stock solution created and supplied by FDLE to create the known simulator solution needed to comply with F.A.C. 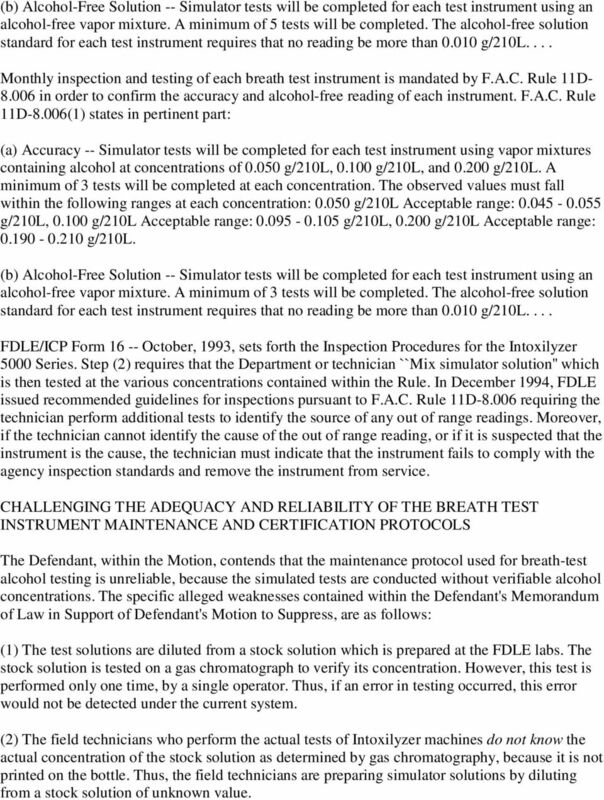 Rule 11D Ms. Gray mixes ``known solutions'' to simulate a 0.050, 0.100, and g/210l breath test. Ms. Gray performs the maintenance testing of the 5 HCSO CBT units on a monthly basis [T-Gray, P-5] and performed the testing of Instrument on April 13, 1994 and May 30, 1994 (the unit used to test Defendant, Steven R. Phillips' breath). 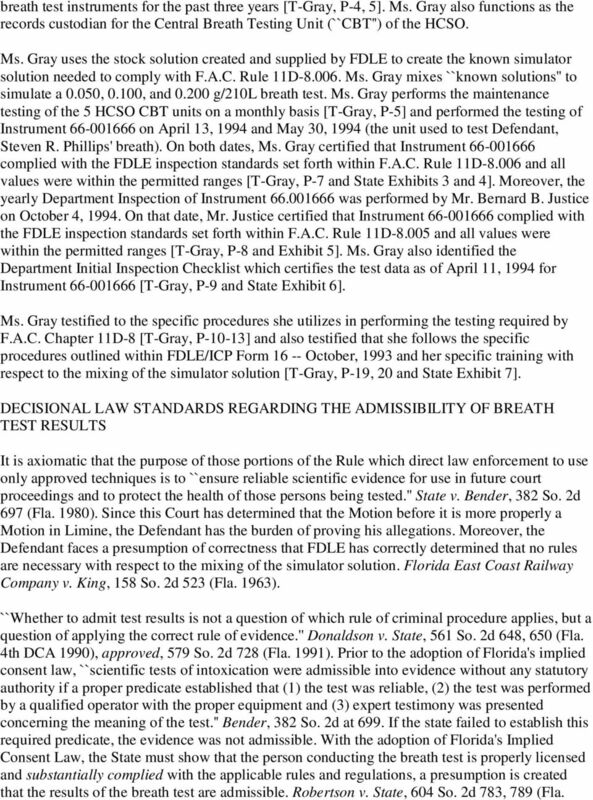 On both dates, Ms. Gray certified that Instrument complied with the FDLE inspection standards set forth within F.A.C. Rule 11D and all values were within the permitted ranges [T-Gray, P-7 and State Exhibits 3 and 4]. Moreover, the yearly Department Inspection of Instrument was performed by Mr. Bernard B. Justice on October 4, On that date, Mr. Justice certified that Instrument complied with the FDLE inspection standards set forth within F.A.C. Rule 11D and all values were within the permitted ranges [T-Gray, P-8 and Exhibit 5]. Ms. Gray also identified the Department Initial Inspection Checklist which certifies the test data as of April 11, 1994 for Instrument [T-Gray, P-9 and State Exhibit 6]. Ms. Gray testified to the specific procedures she utilizes in performing the testing required by F.A.C. Chapter 11D-8 [T-Gray, P-10-13] and also testified that she follows the specific procedures outlined within FDLE/ICP Form October, 1993 and her specific training with respect to the mixing of the simulator solution [T-Gray, P-19, 20 and State Exhibit 7]. DECISIONAL LAW STANDARDS REGARDING THE ADMISSIBILITY OF BREATH TEST RESULTS It is axiomatic that the purpose of those portions of the Rule which direct law enforcement to use only approved techniques is to ``ensure reliable scientific evidence for use in future court proceedings and to protect the health of those persons being tested.'' State v. Bender, 382 So. 2d 697 (Fla. 1980). Since this Court has determined that the Motion before it is more properly a Motion in Limine, the Defendant has the burden of proving his allegations. Moreover, the Defendant faces a presumption of correctness that FDLE has correctly determined that no rules are necessary with respect to the mixing of the simulator solution. Florida East Coast Railway Company v. King, 158 So. 2d 523 (Fla. 1963). ``Whether to admit test results is not a question of which rule of criminal procedure applies, but a question of applying the correct rule of evidence.'' Donaldson v. State, 561 So. 2d 648, 650 (Fla. 4th DCA 1990), approved, 579 So. 2d 728 (Fla. 1991). 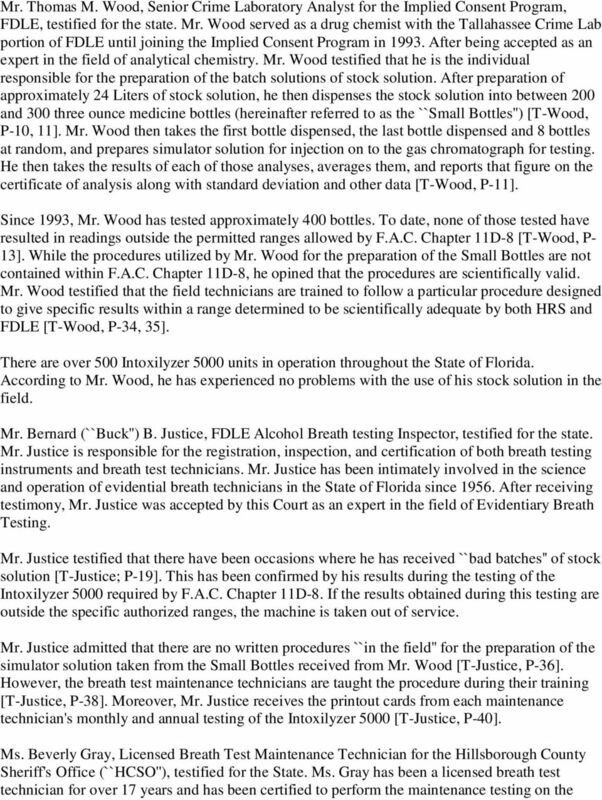 Prior to the adoption of Florida's implied consent law, ``scientific tests of intoxication were admissible into evidence without any statutory authority if a proper predicate established that (1) the test was reliable, (2) the test was performed by a qualified operator with the proper equipment and (3) expert testimony was presented concerning the meaning of the test.'' Bender, 382 So. 2d at 699. If the state failed to establish this required predicate, the evidence was not admissible. With the adoption of Florida's Implied Consent Law, the State must show that the person conducting the breath test is properly licensed and substantially complied with the applicable rules and regulations, a presumption is created that the results of the breath test are admissible. Robertson v. State, 604 So. 2d 783, 789 (Fla.
9 1992). If the defendant objects to the admission of a breath test result and challenges compliance with the testing procedure, the State then has the burden of proving that the tests were conducted in substantial conformity with the applicable rules and regulations. Dept. of Hwy. Safety v. Farley, 633 So. 2d 69 (Fla. 5th DCA 1994); State v. Reisner, 584 So. 2d 141 (Fla. 5th DCA), rev. den., 591 So. 2d 184 (Fla. 1991); rev. denied, 591 So. 2d 184 (Fla. 1991); State v. Ingram et al., 3 Fla.L.Weekly Supp. 193 (Duval County Court 1995). The Court concludes that the Defendant's claim that the Florida Department of Law Enforcement (``FDLE'') procedures for validating reliability are scientifically inadequate and unreliable, is without merit. The uncontroverted testimony presented was that the procedures detailed by F.A.C. Chapter 11D-8 are stringently followed by FDLE, the local breath test maintenance technicians, as well as the breath test technicians who administer the breath tests on a daily basis. Thus, when the stock solution, with a known and certified value, is mixed and introduced into an intoxilyzer, if the number corresponding to the ``known solution'' is obtained, the machine is operating properly and is left in service. If results outside the ranges specified within F.A.C. Chapter 11D-8 are obtained, the machine is taken out of service. The hypothetical situations raised by the Defense are ``far too speculative for this Court to encroach upon FDLE's discretionary authority pursuant to its obligation under (1)(b)(2).'' State v. Misterka, 3 Fla.L.Weekly Supp. 293 (Palm Beach County Court 1995). While this Court recognizes that science is a dynamic and not a static field, the fact remains that FDLE must approve and specify the technology and methods to insure accurate test results. This designation must be ``specific'' and the methods so specified shall be followed in ``all'' such testing. Mehl v. State, 532 So. 2d 593 (Fla. 1993). All such methods and procedures are to be found in formally promulgated rules, following public hearing and input. State v. Reisner, 584 So. 2d 141 (Fla. 5th DCA 1981); See also, (1)(f)(1), Florida Statutes (1993). FDLE can, if it chooses to do so, study the premix simulator solution and thereafter hold a public hearing and promulgate an appropriate rule if it chooses to do so. REFUSAL CASES There is a second group of Defendants who suggest that their Motions to Suppress and/or Motions in Limine be granted because of the specific challenges raised by the Defendant. The Hillsborough County Sheriff's Office uses the C.M.I., Inc. Intoxilyzer 5000 series breath testing machine. This machine has been approved for use by law enforcement (F.A.C. Rule 11D- 8/003(2)) in satisfying the provisions of and The machine and its results are an ``approved chemical or physical test'' of a driver's breath for the purpose of determining the alcoholic content. 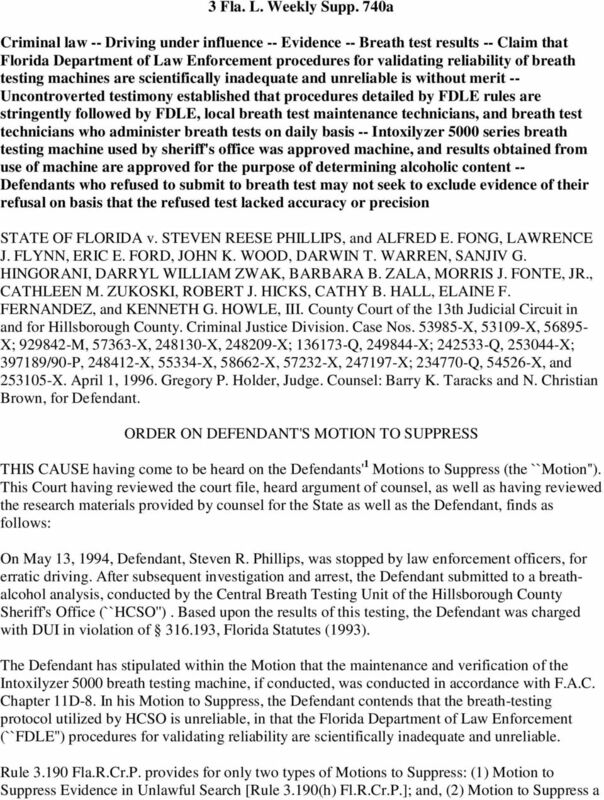 The Court notes that none of the Defendants presented any evidence to establish that an approved test was unavailable in Hillsborough County, Florida, at the time of his or her arrest or that because of their knowledge of the ``unknown value'' of the stock or simulator solution, they requested a blood or urine test as an alternative ``approved'' test. IN THE CIRCUIT COURT OF THE 17TH JUDICIAL CIRCUIT IN AND FOR BROWARD COUNTY, FLORIDA. THE STATE OF FLORIDA, Plaintiff, CASE NO: JUDGE: , Defendant.